MOHAMMAD RAFI – The Enigma ! This article is written by Mr. Biman Baruah, Assam. This article is written by Mr. Venkat Brahmandam. There are many MDs who used Rafi Saab for Raj Kapoor in some Films. The listeners of quality music in India and all over the world remember Mohammad Rafi on his birthday on 24th December, 2008. He had died in 1980 and 28 years passed after his death. Yet he had created an everlasting appeal during his 35 years illustrious career which has not faded away at all. 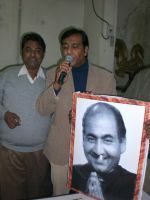 You are currently browsing the Rafians tribute to a true Maestro – Mohd Rafi weblog archives for January, 2009 .